How can this program help you improve your relationship? As our research shows, this program can help you and your relationship by giving you new tools to better understand and come up with solutions to combat your biggest relationship problem. As many couples have done before you, working through the three phases of the program can help you see real improvement in your relationship in only 8 hours – that’s only an hour a week! Want to know more about what you’ll do during the OurRelationship program? See each box below to find out. – View detailed, objective feedback on important relationship components in your relationship. – Know where your relationship stands compared to nationwide norms. – Identify the biggest problem in your relationship. – Key Conversation: Discuss with your partner and decide on the biggest problem(s) you want to address in the program. – Develop a more objective and accurate understanding of your biggest problem. – Learn how natural Differences, Emotions, External Stress, and Patterns of Communication influence your biggest problem. – Gain insight into common stressors and how you can better cope with them. – Learn how to have conversations with your partner about problems in your relationship WITHOUT getting into fights. – Key Conversation: Share new understanding of the biggest problem in your relationship. – After being given examples of specific ways to make changes, identify areas of change that will improve the chance for your relationship success. – Gain more acceptance about areas in your relationship that are harder to change. – Improve communication patterns such as how you respond during and after a fight. – Learn how to avoid common traps that couples fall into when trying to make change in the relationship. – See progress you’ve made in the program. – Key Conversation: Discuss and agree upon changes you want to make to improve the biggest problem and how you communicate about it. But you’ve probably been seeing that a lot. When we look at other websites offering programs to improve your relationship, we see lots of claims that their programs work too. So, before signing up for another program, we encourage you to call them and ask them a simple question – “Has your online program been tested as part of a nationwide, randomized trial and been shown to significantly improve relationships more than a wait-list control group?” Or, if you prefer, we can save you a call – the answer (if they’re telling the truth) is almost certainly going to be “no”. Other programs can get all the nice quotes they want – but we’ve got proof! Your relationship is too important to settle for anything less. So what is our proof? Below, you can see some of the results of our nationwide, randomized study involving 600 people. If you’ve like to find out more, you can read the published, peer-reviewed journal article by clicking here. As part of the OurRelationship program, you and your partner will pick one or two relationship problems to focus on. 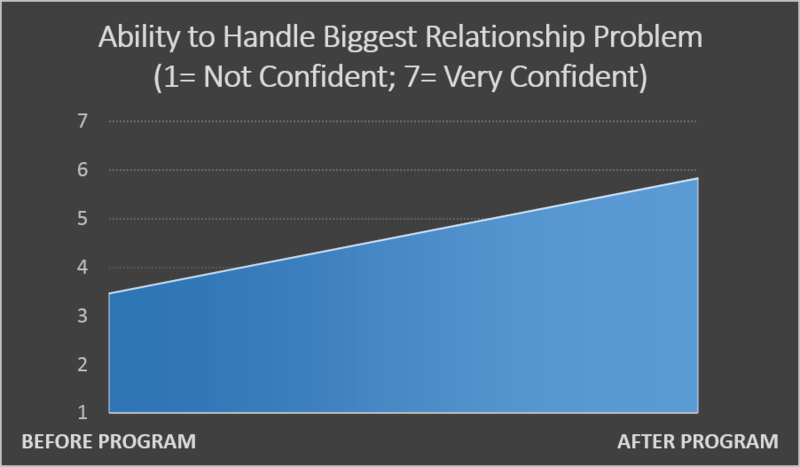 Over the course of the program, couples reported significant improvement in their ability to solve that problem – with the average couple ending the problem feeling “somewhat confident” to “confident”. 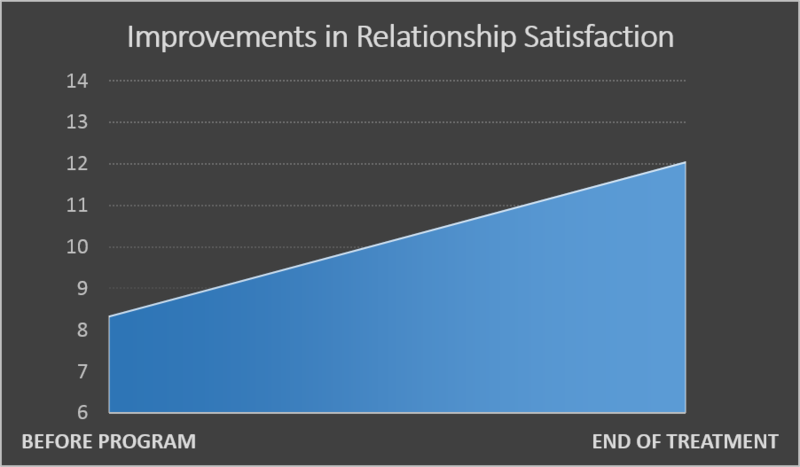 Even more importantly, couples significantly increased their overall level of happiness with their relationship. When you compare the size of these increases to what couples report during in-person marriage counseling, it’s about the same! So, you can get a lot of the benefit of in-person couple therapy for free and in a shorter amount of time. And the Program is Even Better Now! Since the OurRelationship program was tested, we’ve spent considerable time listening to feedback from couples and improving both the content and format to create an even better OurRelationship program. We now provide even more specific guidance on how to solve your relationship problems and make it easier for you and your partner to agree on concrete steps you can take to improve your relationship.